There is one injury I am proud to say I have never encountered throughout my over 15 year running career (knock on wood). In all that time running, including many seasons of cross country and years of endurance trail races, I have never sprained an ankle. Luck, you say? Perhaps, but I have a theory that my 6th grade home room teacher and cross country coach created a daily habit in me that has prevented all of my ankle turning bouts from turning into ankle spraining bouts (Thanks Mr. Marosi!). And that habit is ankle circles! From the time I was in 6th grade on I have pretty much habitually done some ankle circles every day, or at a minimum on a weekly basis. 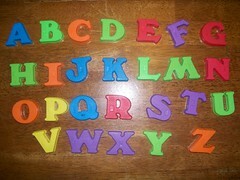 Throughout my running career I have on and off dealt with shin splints and a college teammate convinced me to upgrade my circles to the ABCs to help with that too. Perhaps it’s a placebo effect, but I really do feel like my ankles, calves, and shins are a bit stronger when I consistently do this range-of-motion exercise. If you’re like me and your aerobic exercise is mostly limited to those activities that move forward rather than side to side, your ankles are probably vulnerable to injury when twisted or caught off balance, and you’ll certainly benefit from this range of motion exercise. It’s easy and you can do it anywhere! If you have never done ankle exercises, start with my middle-school ankle circles: using your big toe create a clock wise circle for ten rotations then switch to counter clockwise for ten circles and switch feet for another round, start with small circles and increase to larger circles, all in moderation of course, even small exercises like these can fatigue unused tendons and muscles. If you’d like to upgrade your exercises, we all know circles can get quite boring, consider my college ABC technique: Again using your big toe, spell out the entire alphabet. Try it in cursive, in upper case, in lowercase, and from forward to back on both legs. If nothing else it’s a good excuse to use those cursive handwriting skills that are saved merely for the checkbook these days! And it’s a great mini mid day distraction for those of you who are desk bound 9-5 like me. I hope all of your Salty ankles are strong and ready for some running fun this winter! Have you used ABC’s to strengthen your ankles? Do you believe they work? I’ve never sprained an ankle before, even if I land wrong. I can just walk it off without getting injured. I think I owe my ankle strength to years of dance practice.